Nothing beats the look of real wood. Natural woods add eye appeal to any part of your home, but are especially important in highly visible outdoor decks, porches, and ramps. Of course, these structures will also need to conform to building standards so you and your family can enjoy them in comfort and safety. Here are some questions to consider when you are planning to build a ramp, porch, or deck. Q. 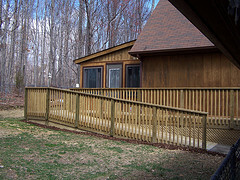 Is a permit necessary when you are planning to build a deck, porch, or ramp? A. That depends. According to where you live, you're likely to need a permit if the structure will be more than 30 inches above grade at any point, or constructed on top of part of your home (such as a basement). In such a case, you will need to submit drawings of both the lot and the planned construction for approval. The design must conform to the International Residential Code® (IRC). Be aware that inspection of the project is required and that you or your carpentry contractor will be responsible for requesting such inspection. Generally, structures less than 30 inches above grade and smaller than 200 square feet in size are exempt from the IRC permit requirements (although they must accord with local zoning laws). However, the IRC is still useful as a safety guideline. Q. What type of wood is best for outdoor structures? A. Redwood and cedar are extremely popular ... and for good reason. They offer rich coloration and rugged good looks to enhance your property's appearance. In addition, their natural resistance to decay means that structures built of these sturdy woods will give you many years of safe enjoyment. Old growth redwood construction can last for 50 years or more! Other woods used by carpenters to build decks, porches, or ramps will generally need to be specially treated with preservatives against rotting. Q. Is building an outdoor structure allowed if it will be above an emergency egress window or door? A. Rooms in your basement which are used as bedrooms are required to have a window or door installed for the purpose of emergency egress. It is permissible to build a porch, deck, or ramp above such an exit as long as the window or door is still capable of being fully opened and there is an emergency exit path at least 36 inches in height. Q. What are the safety considerations regarding construction of an ADA universal access ramp? A. Strength, width, and incline are important for safe use of a universal access ramp to your home. The ramp must be both strong and wide enough to accommodate a wheelchair, walker, or scooter. Planks should be solid enough to bear the combined weight of the mobility device and its user, without buckling or sliding. In terms of incline, for each inch of rise to the home entrance, you'll need one foot of ramp length. This 1 inch: 1 foot ratio is simple to calculate. As an example, if you need to go up 10 inches to get in your front door, the ramp should be 10 feet long. Too steep a ramp will make access difficult and dangerous. If you do not have sufficient space to accommodate the optimal length, two practical alternatives are switchback ramp construction or building to the back entrance, rather than the front. Q. How does building a deck, porch, or ramp affect home value? A. Make sure that you build a well-designed structure of high quality materials. Attractive natural wood decks and porches will add a great deal of curb appeal. This type of home addition tends to have a relatively high return on investment, approximately 80 percent. Construction of a ramp doesn't add value but may add marketability, depending on the location. (For instance, in an area populated primarily by seniors, it will have more appeal than in a neighborhood of young families.) Be careful to take appearance into account, as well as functionality.